2018 marks the 67th consecutive year for the flagship release, Topps Baseball which dates back to 1952. 2018 Topps Baseball is sticking with a streamlined, modern design. Configuration wise, it keeps with many of the traditions established and carved out over the last few years. The 2018 Topps Series 1 Baseball base set continues to have 350 cards. In addition to the regular players cards, subsets include League Leaders, World Series Highlights, multi-player Combo cards, Future Stars and team cards. For the third year in a row, the base flagship design doesn’t have a border. The image is full-bleed with a dynamic modern nameplate at the bottom. With the full-bleed designs, parallels look to use more of the background with tinted highlights and shades. And there are many of them. Rainbow Foil parallels are inserted 1:10 packs. Numbered versions include Gold (/2018), Vintage Stock (/99), Independence Day (/76), Mother’s Day Pink (/50), Father’s Day Blue (/50), Memorial Day Camo (/25), Platinum (1/1), and Printing Plates. Additional 2018 Topps Series 1 Baseball parallels are exclusive to certain types of packs. Negative and Black (/67) cards are in hobby and hobby jumbo packs. Regular hobby packs are the only place to find Clear cards, a partial parallel set of 100 cards with each numbered to 10. Purple parallels are exclusive to Toys “R” Us. As usual, collectors can also hunt for 2018 Topps Baseball variations. These come in two levels: short prints and rookie-themed super short prints. The 2018 Topps Series 1 checklist includes more than 40 Rookie Cards. Leading the way are Boston’s Rafael Devers and Clint Frazier of the New York Yankees. Both made their MLB debuts in July. 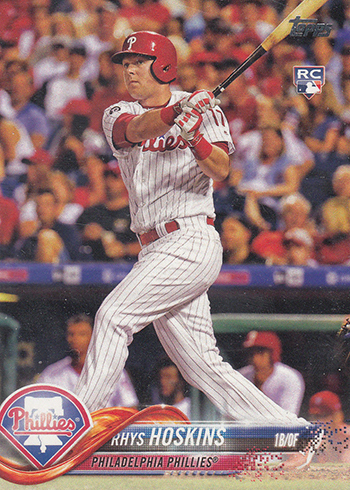 Other confirmed 2018 Topps Series 1 Rookie Cards include Amed Rosario, Dominic Smith, Ozzie Albies, Ryan McMahon, Rhys Hoskins, and Nick Williams. 1987 Topps Baseball played a big role in 2017. For 2018 Topps Baseball, it’s 1983, as it celebrates its 35th anniversary. It starts with an insert set done in the original two-photo design but with current players. These are among the easiest inserts to pull in the product, falling 1:4 hobby packs. On the fresh side is Superstar Sensations (1:8), one of the bolder designs in the product. MLB Awards (1:8) delves into the top players from the past season, highlighting the MVPs, Cy Young Award winners, Rookie of the Year recipients and other categories like Silver Slugger and Gold Glove honorees. Topps Salute inserts are back, albeit with a new design that, like the base set, doesn’t have much in the way of borders. Landing every eighth hobby pack, these look at special events held league-wide during the season like Jackie Robinson Day, Mother’s Day, Father’s Day and Memorial Day. Parallels for all four of the above inserts include Blue, Black (/299), Gold (/50), Red (/10) and Platinum (1/1). Select cards in 1983 Topps Baseball, MLB Awards and Topps Salute have autograph cards. 1983 autograph parallels come in Black (/99 or less), Gold (/50 or less), hobby-exclusive Red (/25 or less), and the hobby- and hobby jumbo-only Platinum (1/1). Topps Salute Autographs and MLB Awards Autographs are all numbered. Signed Salute cards also have Red (/25 or less) and Platinum (1/1) versions. Sketch cards are randomly inserted in 2018 Topps Series 1 Baseball. These have original art done directly on the card. Given their unique nature, all are considered one-of-a-kind. Sketch cards are hobby and hobby jumbo exclusives and not slated for retail packs. MLB Opening Day Logo Patch cards are manufactured relics. Each has the newest Opening Day logo. Numbered parallels come in Black (/99), Gold (/50), Red (/25) and Platinum (1/1). Autographs are also available. Besides the signed versions of existing inserts, 2018 Topps Series 1 Baseball has some standalone autographed insert themes as well. World Series Champion and Postseason Performance Autographs both return, highlighting players from teams who made the playoffs. Base versions are all serial numbered and have Red (/25 or less) and Platinum (1/1) parallels. These also have relic and autographed relic versions that are also numbered and have the same parallels. Topps Reverence returns for a third year. Only found in hobby and hobby jumbo packs, these are autographed patch cards done in a more high-end style than is typical for the flagship product. Gold (/5) and Platinum (1/1) are the lone parallels. Cut Signatures are some of the rarest cards in the release. The few that are included are all one-of-ones. The main memorabilia release in 2018 Topps Series 1 Baseball is Major League Material. While the regular versions are numbered, parallels are. These include Black (/99 or less), Gold (/50 or less), Red (/25 or less) and Platinum (1/1). Some cards also have signed versions. As far as 2018 Topps Series 1 hobby and hobby jumbo packs go, there are two manu-relic sets. MLB Spring Training Logo Patch cards use the season’s new Spring Training logo. MLB All-Star Game Medallion cards spotlight players from the 2017 game. Both of these have numbered Black, Gold, Red and Platinum (1/1) parallels plus select signed versions. The Silver Pack promotion returns in 2018. These are an incentive for Topps collectors to buy hobby and hobby jumbo boxes at Sports Cards Plus. 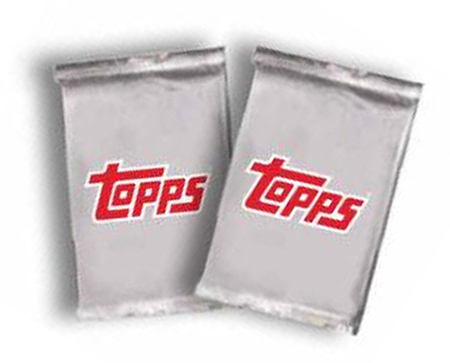 Silver Packs come with a set of exclusive 1983 Topps Chrome Refractors. Parallels and autographs are also randomly inserted. The checklist has 50 cards plus 40 autograph signers. Those who buy from Sports Cards Plus will receive one 2018 Topps Silver pack for every hobby box purchased and two for every hobby jumbo box. SSP cards are noted. These are more scarce than other variations. Card numbers will be added when released.